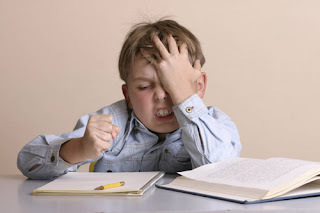 Only Parent Chronicles: Homework Police; Yep, That's Me! Homework Police; Yep, That's Me! I'm not really sure at what point he decided that homework was optional, but we are only at the end of the second school week of the new year and The Boy is behind in 3 classes. WTH! So, in an effort to teach The Boy some accountability and develop some better study skills, the teacher has finally gotten on board. Beginning yesterday, each Thursday, all of The Boy's teachers will email me a list of any late/missing work, assignments with upcoming due dates, and The Boy's current grade. THANK YOU!!! FINALLY! See, the elementary school does not have student's grades on line. Teacher participation is the only way I can keep tabs on him. Needless to say, picking The Boy up from school yesterday armed with a list of what is missing and what is soon due caused a little drama. Not only did The Boy not have all of his materials with him, his homework file had 2 completed assignments (that are late) just sitting there. He was none too happy when we (yes we... he said I embarrassed him, hehehe) marched back into the school for him to turn them in. Embarrassed? He was embarrassed? Tell him next time you'll put on your Super Mom cape before marching back inside! Good for you!! Sometimes a little embarrassment goes a long way! Yes yes yes!!! You go girl! It's so frustrating when you don't know what's going on with the kids in school. There are alot of teachers that are so great about communicating with parents but there are just as many that aren't so great. I'm sure they probably see alot of parents that don't care to communicate too. How frustrating about the teachers!!! I would flip my s**t! LOL. My girlfriend has the same problem with her 12 year old son. She has the same setup as you. What she did to curb the behavior which has worked very well is that she makes him do the assignment over each time he doesn't turn it in. He sometimes does it 3 times. Good luck with it. gawd...that brings back memories. when i was a kid, i would do my homework (sometimes) and then forget to turn it in. or not turn it in because i didn't think it was "neat" enough and i was too embarrassed. my mom did the same thing to me...grounded me from everything but homework. eventually, i grew out of it. hang in there...good habits now make for a better student later. Ugh, I'm the sole Policewoman of Homework at our home and it sux. Good luck keeping him in line!